The Fellow is Northwestern Michigan College's highest honor, awarded annually since 1964. Fellows may be nominated because they have demonstrated influential networking on behalf of the College, have demonstrated a pattern of outstanding financial or personal time contributions to NMC, or as a retiree of the College continue to contribute back to their academic or professional fields as volunteers, mentors or advisors. Exceptional contributions in one or more of these areas may justify nomination. No staff, faculty, or trustee shall be named a Fellow while still employed or in office. 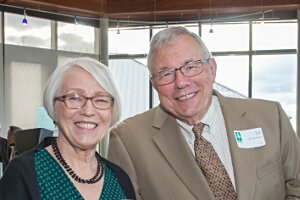 Longtime Dennos Museum Center supporters Dr. Edward and Sharon Rutkowski have been named the 2018 recipients of the NMC Fellow award. "We are pleased to help give children a fun introduction to the Dennos Museum and hope to expand their appreciation of the arts and their community," the couple said. Please submit your nominations for the 2019 Fellow to the NMC President’s Office by Monday, December 3, using the form above either by hard copy or email to nmcpresident@nmc.edu. 2007: Donald Oleson, Sr., Gerald Oleson, Jr.
1991: Sen. George A. McManus, Jr.
1989: Gordon Lightfoot, Arthur M. Schmuckal, Mary E. Schmuckal, Adm. Willard J. Smith, U.S.C.G. 1981: Lester M. Biederman, Warren W. Cline, M.D. 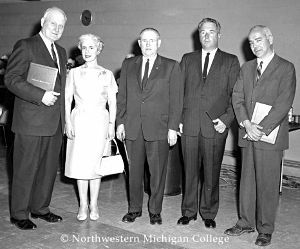 1964: Arnell G. Engstrom, Gerald Oleson, Frances Oleson, Ferris J. Rennie, Harold Wise, Imogene Wise, Ellis A. Wunsch, Ph.D.